To be held at the Roma Administration Centre on 13 November 2013. Local Government Regulation 2012 Section 275(b) industrial matters affecting employees. Surat & District Development Association (SDDA) has written to Council supporting Council’s decision to review position retention and the role of Community Development in the Surat Community. The group has obtained a listing of signatories in favour of this approach and further requests Council engage with the Surat Community as part of the position and role review. 1. Council receive and note the email and recorded signatories tabled. 2. Council note that the results of the community consultation held on 15 October 2013 are included in the Report on the Organisational Structure within a separate agenda item. An email was received from SDDA on 8 October 2013 indicating support of Council’s decision to review position retention and the role of community development in the Surat community, having received verbal confirmation from the CEO that Council was of the opinion that a review of the role of community development was required for all smaller communities in the Region. The group, (SDDA), had also obtained a signatory listing containing 176 names and personal phone numbers of residents in favour of this approach. It was further requested Council engage with the Surat Community as part of this review. The covering letter from SDDA and the listing of signatories will be presented to Council at the meeting. 2. The community (through Councillors) and staff (through the Chief Executive Officer) be engaged in relation to local community needs, and how best to shape Council’s resourcing by town. The observation was made that each of the communities’ needs are quite different, and the question was posed that perhaps a ‘one size fits all’ approach is not meeting all needs. Further that perhaps a more holistic/multi-dimensional consideration of all issues might be valuable at this juncture. To ensure the community has had an opportunity to formally provide input into the future direction of Community Development in Surat, Council held a public forum in Surat on 15 October 2013, inviting all residents to provide their thoughts and feedback. Feedback can be submitted on-line via Council’s website until 23 October 2013. Community Consultation is a valued activity that assists Council in determining priorities and informing decision making processes. 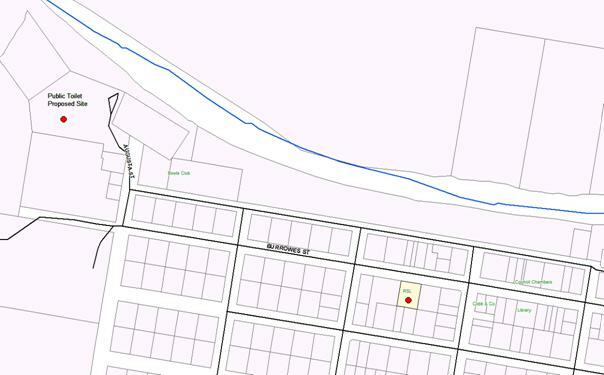 A letter of petition has been received by Council in response to the approved development of a workers camp located at 141 Pickanjinnie North Road, Pickanjinnie. ”Undefined Use” (Non-resident Workforce Accommodation – 480 units in five stages), Storage Facility, Operational Works, ERA 63-Sewerage Treatment & ERA 8 – Chemical Storage On land situated at 141 Pickanjinnie North Road Pickanjinnie QLD 4428, Lot 218 on WAL53394 and Lot 219 on WV1588. To obtain approval, the application was required to undergo public notification. The public notification period was open for a minimum of 15 business days, with public notices placed in the Western Star on 10 May 2013 and June 2013. The comment period for the application had closed 28 June 2013. Four properly made submissions were received during this period. The submitters will have appeal rights. The petition presented was received by Council on 30 September 2013. Council had approved the development application on 14 August 2013. The relevant officers are currently reviewing the matters raised, in preparation for a further report to Council for consideration. This will be addressed where applicable as part of the separate report. This report provides a copy of the confirmed meeting minutes of the advisory committees that held meetings during the months of August/September 2013. That Council receive and note the confirmed minutes of the Airport Advisory Committee (04/09/13). Council initiated advisory committee meeting minutes are circulated to Councillors on a monthly basis to ensure Council is aware of committee items discussed. The most recent confirmed minutes of each of the committees that have convened during the months of August/September are attached. 2. The attendance of Cr. Ree Price at the 2013 National Local Roads & Transport Congress – Sustaining our Roads on 12 – 14 November 2013 in Alice Springs. The Mayor has received an invitation to attend the 2013 PCYC Town & Country Gala Ball on 26 October 2013, in Brisbane. Due to conflicting appointments on that date, the Mayor has requested Cr. Peter Flynn give consideration to attending the event on his behalf. Cr. Flynn has confirmed his availability to attend. The event provides Council an important opportunity to network with attendees at the event and strengthen the working relationship between local government and representatives of PCYC. The 2013 National Local Roads and Transport Congress – Sustaining our Roads will be held on 12 – 14 November 2013. Cr. Price, Chair of Rural Roads, has indicated an interest in attending the conference given the large road network maintained by Council in the Maranoa, and the challenges in delivering capital and maintenance road programs that meets community expectations. Community consultation was held in Surat on 15 October 2013 to gather and share Maranoa Early Learning Centre information. Feedback from residents highlighted the need for further child care investigations, community engagement and information sharing. Follow up discussions with not-for-profit organisations has highlighted an interest and request for further operational and business information. Follow up discussions with the Surat State School Principal has also highlighted interest in pursuing the transition of the Kindergarten to school grounds. Considering the timeframe involved with this exploration, it is recommended that Council continue the status quo until long term sustainable alternatives are certain. 4. Recommendation for Council to continue the Maranoa Early Learning service delivery until December 2014. 5. Recruitment of a Specialist – Early Childhood position - 12 month contract. 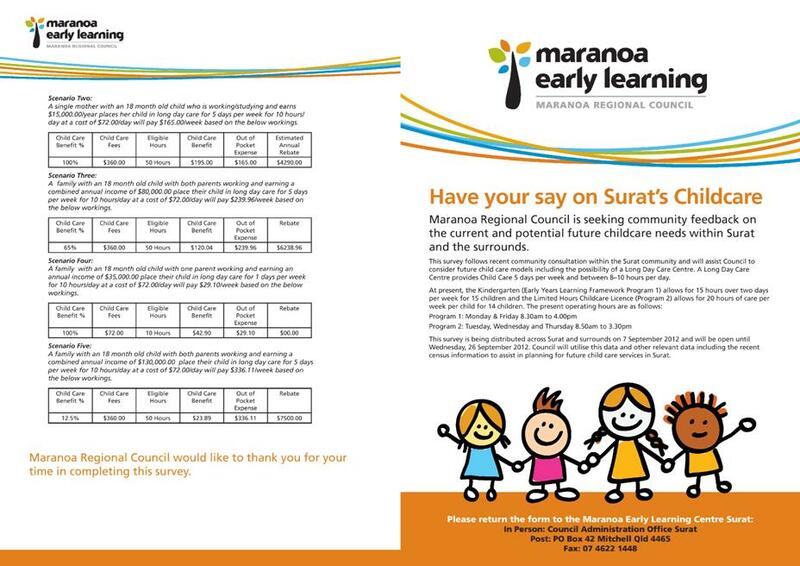 In order to gather and share information regarding the future of the Maranoa Early Learning Centre, community consultation was held with Maranoa Regional Council CEO and Councillors in Surat on 15 October 2013 (n=45). 4. The need for a long day care service and after school care*. *significant proportion highlighted this last point as a need. Resident feedback was conclusive that child care is needed in this community. Survey results will provide valuable and current information on the type of care most sought in Surat; that being long day care, after school care, family day care and kindergarten. In addition it will provide the short and long term projections which will assist business analysis development for Council and other child care service providers. Follow up discussion with Pauline Newton from the Uniting Church and Leanne Rutherford from the Churches of Christ has highlighted an interest and request for further business and operational information. The Uniting Church has recently established the Mitchell Kindergarten and Day Care Centre and expressed that it would be an advantage for their current business to expand. It was also acknowledged however, that this would take time to develop. The Uniting Church requested information for both Kindergarten and Day Care services whereas, the Churches of Christ requested Day Care service information only. Development of a business analysis for service provider distribution is recommended. Interim financial analysis of staff wages for a private organisation to manage the Day Care centre has identified significant savings. For a privately managed service, the estimated total wage package for Day Care staff would be estimated to be $55,000/ annum as opposed to Council’s total wage package for Day Care staff being $143,000 / annum. In order for Council to make an informed and final decision regarding the long term future of Surat child care, the need for further investigations, engagement and information sharing is evident. However, the time involved for this to occur appropriately is extensive. Considering the centre’s staffing requirements, that being the temporary nature of the Director’s position and the impending departure of the Kindergarten teacher (COB 20 December 2013), it is recommended that Council comes to a definitive decision for the mid-term. It is proposed that Council continue Surat Child care service delivery until sustainable alternatives can be reached. A suitable and attractive time frame for qualified staff contracting purposes would be 12 months. The suggestion to minimise staff numbers and reduce wage costs would be to combine the two positions (Director and Kindergarten teacher). The offer of a full time position plus the incentive of accommodation may be attractive to a newly graduated Early Learning Teacher. Limitation to this scenario is sick leave relief however brokerage of a teacher from the state school could be sought in that instance. Discussion with the Surat State School Principal has highlighted the continued interest in transitioning the kindergarten onto school grounds. He is keen to progress these discussions with Maranoa Regional Council – Community Care, Office of Early Childhood Education and Care and Education Queensland. It was also acknowledged however that this would take time to develop. The estimated cost of wages for the combined position with allowances is $113,631 and estimated costs of housing is $9,100 - with an overall total of $122,731. This can be compared to the individual wages; Director ($93,432) and a permanent part-time Kindergarten teacher ($42,999) with an overall total ($136,431). Corporate Plan 2009-2013 — 8.4.7(d) To provide an advocacy role for the provision of child care services and facilities as required so as to address the needs of residents in the region. Community Aged Care Packages (CAPS) are being replaced with a new model, Consumer Directed Care. Maranoa Regional Council can either transition their packages to the new model or exit by no later than June 2015. External community care service provider consultation is required. This will provide information regarding the future delivery of this service to the region and provide a basis for further Council recommendations. 1. Manager – Social Services and Coordinator – Community Care to consult with key stakeholders regarding their interest and intentions with respect to Consumer Directed Care service delivery for the Maranoa. 4. Office consultation with BlueCare. 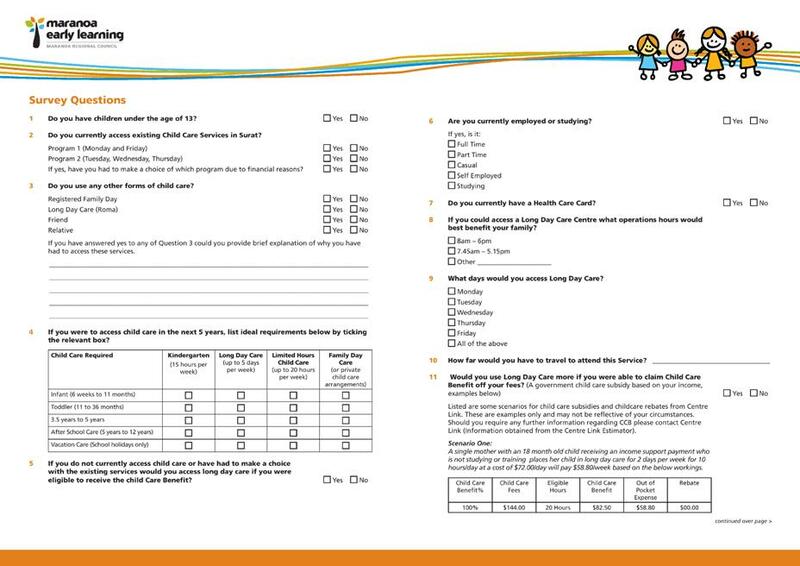 In 2010, the Department of Health and Ageing piloted Community Age Care reforms throughout Australia and as a result, a new Home Care Package commenced 1 August 2013. This program has replaced the former Community Aged Care Packages (CACPs), Extended Aged Care at Home (EACH) and Extended Aged Care at Home Dementia (EACHD) programs. Maranoa Regional Council currently has CAPS packages in Surat, Roma and Wallumbilla. Maranoa Regional Council can either transition or exit the current model by no later than June 2015. In order for Council to make an informed decision to transition or exit by June 2015, consultation with other potential service providers is required. This will provide valuable information regarding their interest in delivering this service and their intentions with respect to service delivery to the region as a whole. Results from these findings will be communicated back to Council and guide further recommendations. Corporate Plan 2009-2013 — 8.4.7(f) To undertake a review of all Community Care services with a view to identifying any issues which need to be considered by council as part of their service provision obligations. The Santos GLNG Food and Fire Festival 2013 attracted approximately 5,000 visitors and was well received by the wider community in the Maranoa. · Showcased and developed an appreciation for the arts and cultural talents that exist in our local community and across the state. · That Council endorse forming an advisory committee 18 months prior to the 2015 event comprising of Councillors, community members, sponsors and council staff. The Santos GLNG Food and Fire Festival attracted 4928 visitors to Bassett Park on Saturday 14th September 2013. The event was previously held at the Big Rig Parklands and was moved to Basset Park to allow for potential growth of the event and to utilise the facilities available at Bassett Park. The major challenge with the move to Bassett Park was to create the ambience and atmosphere that was a unique feature of the previous venue at the Big Rig Parklands. With a program full of entertainment, workshops, cooking demonstrations, an art exhibition, flame throwers, a beach with a sand sculpture, the site was transformed to portray a festival environment celebrating the culture and community of the Maranoa. 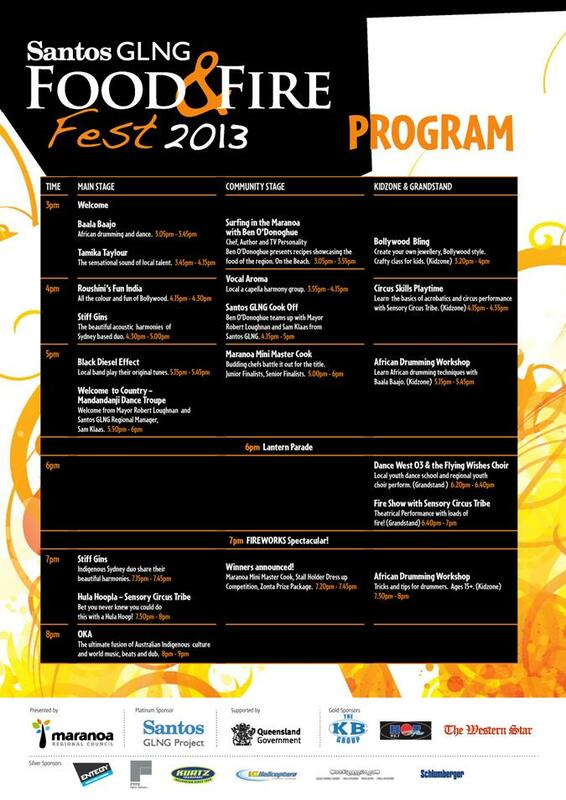 Refer to the attached Official Program. As the visitor tally indicates, this year’s event exceeded the attendance of previous years and firmly placed the Food and Fire Festival as a premier attraction to the local community and tourists to the Maranoa. The event continues to be a positive development activity for the community enabling groups and organisations to participate in a variety of ways whilst encouraging the greater community to interact socially. These, plus the Tourism benefits noted, mean that it is important for Council to continue its support and affiliation with this event. The 2013 event attracted a number of sponsors through contributions of financial and in kind support and totaled $34,000 (ex GST). In comparison to the sponsorship raised for the 2011 event there was an increase of approximately $2925. the ‘Cook Off’ between this celebrity and local, well-known identities. The inclusion of the ‘Cook Off’ presented an entertaining and fun aspect to the program and highlighted the partnership with Council and the naming rights sponsor. The contract with Santos GLNG was for three events with the 2013 Food and Fire Festival ending their commitment however continued networking with this organisation hopes to lead to their continued support for future events. The expenditure for the 2013 Santos GLNG Food and Fire Festival totaled $86,757, less sponsorship, market/food stall holders and grants/subsidies received of $46,229, meant the cost to Council was $40,528 (ex GST). Refer to attached Budget for breakdown of costs. o The Community Culture Café brought together the flavours of the region with members of Roma’s multicultural community sharing the tastes from their country of origin. o The celebrity chef’s use of local produce to allow for the promotion of key local industry. o The inclusion of music to celebrate the multicultural aspect of the program by engaging African drumming troupe – Baala Baajo, nationally acclaimed artists - the Stiff Gins and international festival favourites – OKA. o The market style atmosphere that attracted 40 stall holders selling a variety of international food and assorted clothing, crafts and home wares. Please note, feedback collected from all stall holders and community groups has led us to identify a need to review the location of certain sites and this will be used to make improvements at the next event. Please note, all schools and groups involved in this initiative have noted the value of this exercise and displayed a keen interest for their participation again in the future. o The addition of the inaugural Maranoa Mini Master Cook that provided an opportunity for our youth with a passion for cooking to develop their culinary skills. Successful partner ships between the Community Development team, ‘Be Healthy Maranoa’, SQIT and local businesses attracted contestants from across the Maranoa to participate in the initial ‘cook-off’, gain valuable knife and culinary skills and participate in the final showdown at the Festival giving them a rare opportunity to learn from the experienced celebrity and local chefs. o The event included a Kid’s Zone venue to explore creativity and development for children and parents. The workshops in African drumming, Bollywood hand and feet jewellery making and circus skills appealed to the wider audience. Feedback collected from previous events led to an increase in these workshops throughout the day and evening and appeared to also be a highlight of the event. · The ‘Elements’ Art Exhibition provided an opportunity for over 50 of the Maranoa’s talented artists to showcase and a vital source of recognition of the local talent. o Ease of assistance for community groups with regards to vendor and food licensing requirements. The success of this event can also be attributed to the extensive and well planned marketing campaign which extended to the Gold Coast, Brisbane, Toowoomba, the Balonne Shire and Chinchilla through print and radio, in addition to a saturated campaign through local media channels. The event was promoted as a community event on Imparja television and sponsorship with Southern Cross Media, the Western Star and local radio stations allowed for further reach and frequency. The marketing campaign introduced the inclusion of a social media strategy to complement the existing communications plan which proved to be very effective. The addition of the event mascot – Chili, the Dragon also proved to be a successful promotional tool as a visitor to local schools, community events and around the region. Volunteers, including the use of the Mitchell Work Program and Corrective Services, also proved to be an invaluable and vital part to the success of the event. A survey was developed to capture the responses of visitor perceptions through the online survey monkey application and approximately 80 responses were received. 22% would like more entertainment, 17% said no improvement and 13% indicated they would like more food options. · The creation and facilitation of a ‘Food & Fire’ committee that could compromise of Councillors, staff, community organisations and sponsors would enable valued input and commitment at the commencement of the planning process. · Details with regards to the program, site locations, timing of speeches, etc could be effectively made with feedback collected from previous events and input from these committee members. · The inclusion of council staff from other departments in this committee would ensure plenty of time for planning for support with other valuable council resources such as the Parenting Van, Maranoa Regional Council information, etc. · Marketing and promotion of the contribution from Maranoa Regional Council needs to be a priority and clearly displayed at the next event. · Inadequate lighting should be addressed in the Baster Park Master Plan and relevant feedback has been forwarded. Whilst the 2013 Santos GLNG Food and Fire Festival has been noted as a success, it is recommended that a committee be considered for this important community event to continue successfully. The positive outcomes that can been seen for our local community as well as our future tourism opportunities will only continue if we foster an approach of continuous improvement and the formation of this committee is a positive step towards this. It is proposed that the 2015 Food and Fire Festival be scheduled for Saturday 19th September, 2015. 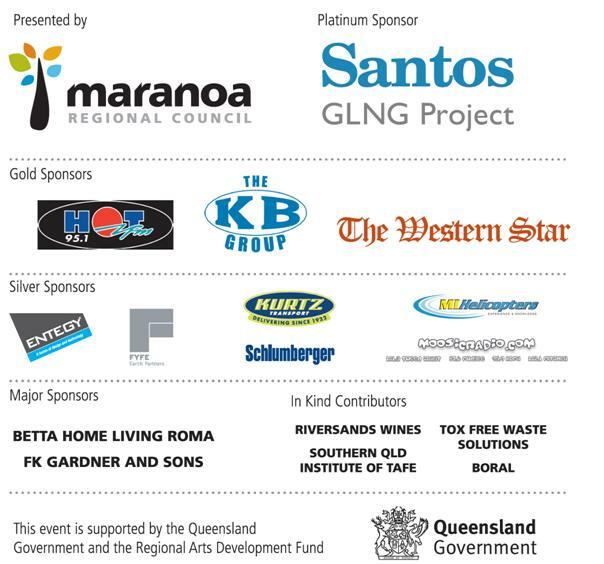 As the contract with Santos GLNG as the naming rights sponsor has expired, the event sponsorship may be reduced by $20,000 for future events. However, all efforts will be made to continue this partnership should Council wish to do so. With positive community perception for the Food and Fire Fest, sponsorship packages can be increased and the Maranoa Regional Council could easily be promoted as the primary presenting partner. Consultation with Council Infrastructure staff in August 2012 determined the required amount to be included in the budget at $3,000 for the scope of works in the set up and pull down of the event. This initial quote was exceeded by 350% with the final amount reaching $10, 624.16 due to staff being rostered for RDO’s despite the continued consultation with this directorate. This cost consists of a staggering 12% of the overall costs noted in the budget. 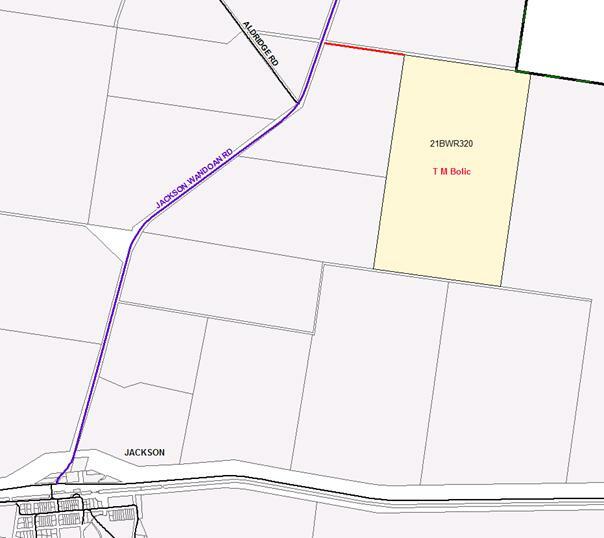 Council has received a request from Theresa Bolic to construct a road, connecting to Jackson Wandoan Road, to provide access to the land parcel of Lot 21 on Plan BWR320. An inspection of the section was completed on 11 October 2013. The Bolic property is approximately 800m from the Jackson Wandoan Road. No surveyor’s pegs were observed upon inspection. Evidence of a graded path (unformed) running the length of the road reserve to the land parcel was observed, although it is unclear as to who completed these works and when. This track, even though somewhat overgrown, is accessible by 4WD. The current vehicle access point to this track runs through another property which has fenced off the road reserve at the Jackson Wandoan Road entry point. There is evidence that the road reserve has previously been cleared in most parts. In addition, several floodways were observed, 2 of which could potentially form boggy patches cutting access. There is a second road reserve leading from Jackson Wandoan Road to the southern end of the property, approximately 3km in length, which has a fenced entry point and there is an unformed track beyond this. Prior to any road forming a complete survey of the section would need to be undertaken at additional costs to establish the road reserve area. Depending on the positioning of the road reserve there may be a potential cultural and heritage impact. The minimum required works to provide sufficient access would be a heavy formation grade and gravel inverts (approximately 50m gravel) across 2 floodways. It is these works that the cost is based on. Given that grading this section would become a new road Council would also need to consider naming it. Also, Jackson Wandoan Road is a state controlled road and Council would need to liaise with the Department of Transport and Main Roads for the standard of intersection required. The construction of the intersection would be an additional cost. Capital Cost of $ 66,360.00 for the road formation and an increase of $ 395.55 per annum in maintenance and renewal costs. There will be additional costs associated with surveying, intersection construction, and potentially cultural and heritage clearance. Council has received a request for a footpath to be constructed, or a gravel sheet be laid, outside the Surat Day Care Centre on Burrows Street, and for a public toiled to be erected at the Surat weir. Council has received a request from Pam Ferguson that Council construct a footpath or place gravel outside of the Surat Day Care Centre (part of the RSL Community Centre) on Burrows Street and for a public toilet to be built at the Surat weir picnic area. These facilities were inspected on 10 October 2013. Upon inspection of the Day Care Centre it was observed that there a concrete public footpath along the entire frontage of the land parcel on which the Day Care is located. Also a paved semi-circle driveway and ramp allows wheelchair access to the Day Care Centre through the main building, and a section adjacent the main RSL Community Centre building had a layer of crusher dust and beyond that grass which led to the Day Care Centre side entrance gate. These were in average to good condition with the lawns and gardens well maintained. Day Care Staff were consulted and they mentioned that an area near the side gate sometimes has water pooling at the entrance making the ground sodden, however this matter has been referred to the Coordinator for Roads and Drainage South (Surat) who advises it will be monitored and rectified under maintenance or when requested by the Coordinator of the Day Care Centre. It is advised that placing a gravel layer over the crusher dust may cause a greater risk should a slip, trip or fall incident occur. Also this side entrance is wheelchair/pram accessible and placing gravel would inhibit wheel motion and hence be more difficult to cross. Given that there is an alternative wheelchair/pram accessible entrance through the main building the construction of a cement footpath is not warranted at this stage. Upon inspection of the weir picnic facilities it was identified that water supply was present however sewerage connection was more than 350m away. The nearest toilet facilities to this are those located under the Council building a distance of 1150m. The town crews of Surat do not recall extraordinary levels of cleaning be required at this site. The Coordinator for Council Buildings and Structures has advised also that when compared to other communities Surat has the most public toilets within the Maranoa region, including Roma, therefore they would class this request as low priority. The public toilet options investigated include; option 1connection to utility infrastructure and option 2 an onsite treatment system. The Manager Water, Sewerage and Gas has advised that option 1 is more easily maintained and if option 2 was adopted that consideration would need to also be given to the fact that the proposed location is in an environmentally sensitive area (beside the Balonne River) and Council would need to demonstrate regular servicing to mitigate contamination. Furthermore, advice was also given that should either system need replacement that option 2, the onsite treatment system, would be far more expensive to replace. The proposed location is also in a flood zone which means consideration of the elevation of the electrical board, this is more easily achieved with option 1 and the fact that option 2 has an aerator that needs to be kept dry or it will be damaged. Option 1 will have a total Capital Cost of $ 84,035.00 for the installation and connection to utility infrastructure and an increase of $ 12,377.77 per annum in maintenance and renewal costs. Option 2 will have a total Capital Cost of $ 77,035.00 for the installation and set up and an increase of $ 12,806.67 per annum in maintenance and renewal costs. Council adopted the Schedule of Fees and Commercial Charges on 31 July 2013. Council also resolved to delegate to the Chief Executive Officer the power to amend Commercial Charges under Section 262 (3) (c) of the Local Government Act 2009. At the Councillor workshop on 10 September 2013, Council reviewed Community Hire Hall Fees and considered the impact of fees, as included in the adopted Schedule of Fees and Commercial Charges, on small Health and Well-being businesses operating in our halls. Council is asked to adopt the amended fees and charges. That Council adopt the new fees and charges for hire of its Community Halls by Small Health and Well-Being Businesses with the new hire fees to apply from 24 October 2013. Council has reviewed and agreed to a new fees and charges structure for hire of its community halls. As the new structure is being implemented, it is becoming apparent that some small business owners who operate in our halls on a regular basis are going to be paying significantly higher hire rates under the new charging structure. At the Councilor workshop on the 10 September 2013, Council considered a new hall hire fee structure. This new structure provides for an additional category of fees and charges being Small Health and Well-being Business. Small businesses who regularly use Council Halls include Dance West, Wots on Gymnastics, Birrali Schefe Dance and Annabelle Chandler - Pilates. The definition of a Small Health and Well-Being Business is a business with one instructor who holds appropriate insurance coverage and qualifications for the activity. Category 1 Hall – (Hire fee includes use of hall, kitchenette, air-conditioning, tables & chairs). Amby Hall, Mungallala Hall, Hibernian Hall, Surat RSL Hall (only), Ernest Brock Room, Injune Hall Kitchen. Management reports to the Council on changes to the Register of General Fees and Commercial charges to ensure appropriate approvals are in place manages this risk. The changes to the Register of General Fees and Charges reflects the policy of Council to encourage health and well-being activities within the community. Minimal financial cost to Council. A membership invoice of One thousand five hundred and thirty one dollars and twenty cents ($1531.20), has been submitted to Council for renewal of its Murray Darling Association Inc. membership for the 2013/2014 financial year. Approximately two years ago, Council became a member of the Murray Darling Association Inc. The Associations prime focus is to manage water in the Murray Darling Basin, across the applicable States. The Authority was established under the federal Water Act 2007 as an independent, expertise based statutory agency that has a basin wide focus. The organizations activities are required to support sustainable management of water resources that best meets the social, economic and environmental needs of communities within its charter. The Association is very active in southern States, however minimal activities and projects are implemented by this Authority within the Maranoa Region. Subject Heading: Application for Amalgamation of Land. The Department of Natural Resources and Mines seeks Council’s views on an application for Amalgamation of Lot 58 on DL356 and Lot 38 on DL361. This land is located north east of Mungallala and is used for grazing purposes. 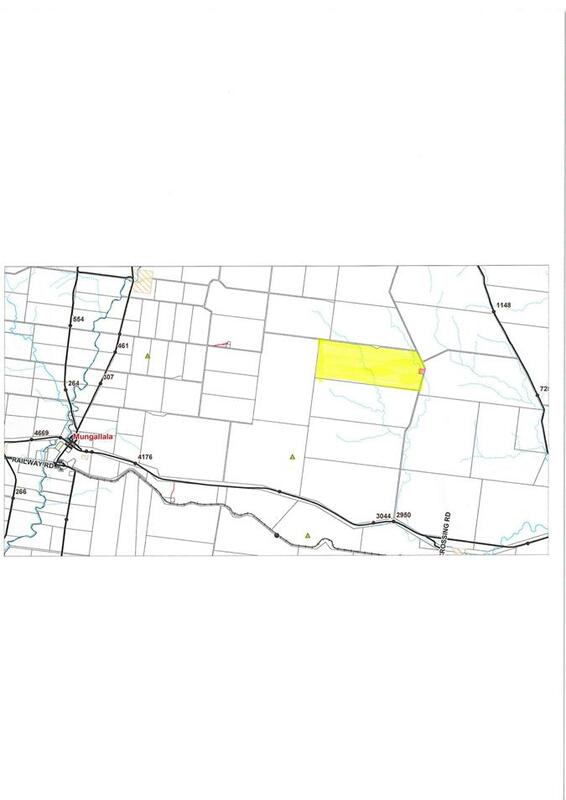 That Council advise the Department of Natural Resources and Mines that it has no objection to the amalgamation of Lot 58 on DL356 and Lot 38 on DL361 with the proposed use of the land being for grazing purposes and furthermore that there are no known non-indigenous cultural heritage values associated with the land. The Department of Natural Resources and Mines has received an application for the amalgamation of Lot 58 on DL356 and Lot 38 on DL361. In accordance with usual practice, the Department of Environment and Resource Management is seeking Council’s views or requirements including information on any local non-indigenous cultural heritage values that the Department should consider when assessing the application. This land is situated north east of Mungallala and is used for grazing purposes. Lot 58 on DL356 has an area of 4.047 hectares and Lot 38 on DL361 has an area of 11,509.445 hectares. Nil financial risk to Council.